So, when Paul and I received an invite to try Peruvian food at Tiger's Milk, I got soooo excited! Neither of us have had Peruvian food in our lives so this was definitely a first for us. What makes it more interesting is that Tiger's Milk is located right at the heart of the central business district so there's really no need to travel to the far end to have a taste of Peru. I got to the restaurant ahead of Paul and while waiting for my dinner date, I took the opportunity to take a photo of our beautiful view. 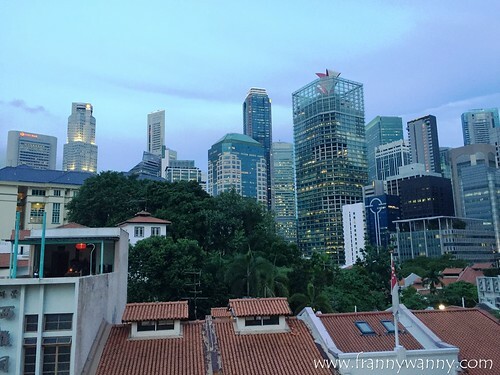 Oh Singapore, you're so pretty! This is why I'm so in love with this city. Now, let's look at the restaurant. 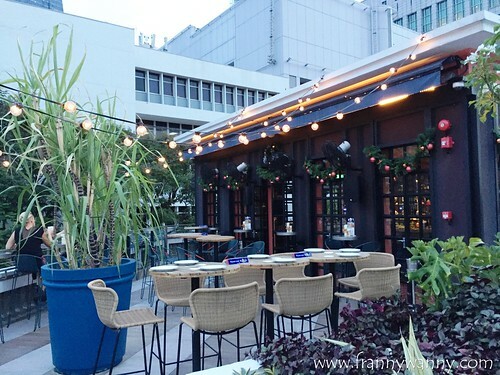 It can be found at the rooftop of the newly opened The Club Hotel along Ann Siang Road. I really love this area especially during the weekend where they would close off the road to cars and pedestrians can freely walk around. To get to the restaurant, you can enter the hotel and take the lift up or if you're in the mood for a pre-meal workout like yours truly, then take the staircase which you can access from the side entrance. Either way, you'll love the relaxed and chic ambiance of the restaurant. At night, it might be a good idea to dine al fresco but since we love it extra cold, we requested to stay by the bar area where it's air-conditioned. 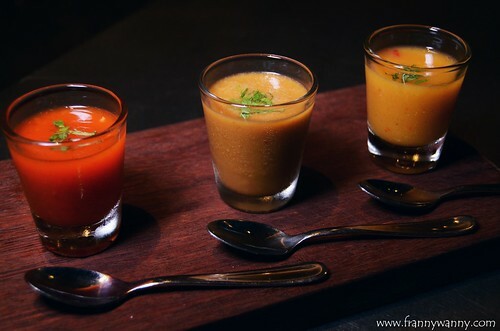 Our dinner began with the Tiger's Milk Trio (S$9) which was an interesting mix of three different styles of ceviches. 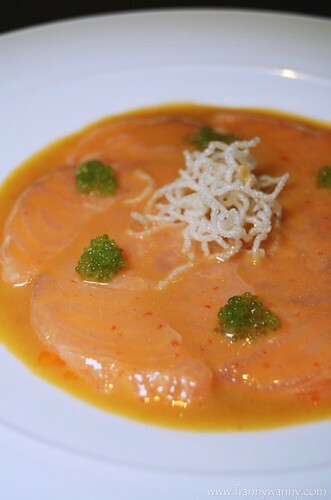 As it turns out, ceviches, which is a raw seafood dish chopped and served in a citrus sauce or juice originated in Peru. It's closely similar to the Pinoy Kilawin which has a similar preparation using chopped raw fish mixed with vinegar and lime juice. At Tiger's Milk, you get 3 shots of chopped seabass and octopus served in three types of juices. What sets them apart from one another are the varying degrees of spicy levels that each juice has. Upon hearing this, I proceeded with caution. I first tried the Amarillo which was the mildest of them all. The spicy level was tolerable and both Paul and I loved it. Next was the Rocoto, it was definitely spicier but we somehow managed by simply fishing out the chopped seafood inside. The last was the Nikkei which I skipped. I was afraid to burn my taste buds or to get a bad tummy ache from too much spice. Paul was a brave soul and tried a bit however he said it was really fiery hot. To balance out the spicy hot starter, we had the Causa (S$16) which was one of my favorites that evening. Look how beautiful it is! 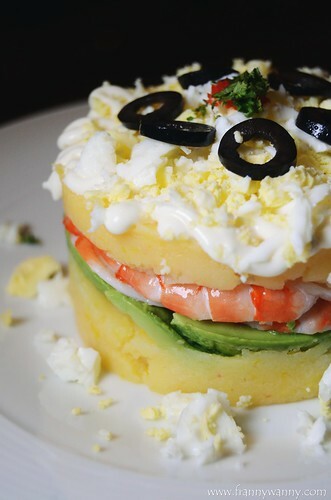 A lovely creation of mashed potatoes, shrimps, slice avocado in Amarillo juice and topped with chopped eggs. It has everything that I love and I know this is all screaming "carbs! carbs" I ignored those screams and ate my heart out. 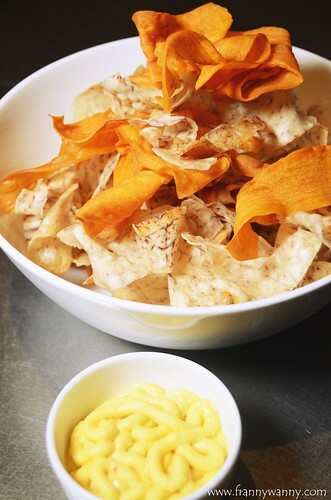 Before moving on to our main dishes, I saw the bartender filling a bowl with what looked like taro chips. I asked about it and tadah! We also got our own bowl of Taro and Sweet Potato Chips which, I was told, was a popular bar chow at Tiger's Milk. Well, chips and alcohol, they just go perfectly together. As if we didn't had enough ceviche for our starter, out came two more -- the Classic Seabass Ceviche (S$14) and the Salmon Nikkei (S$16). 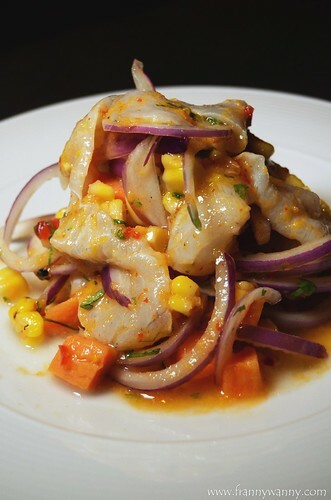 The Classic Seabass Ceviche is a beautifully plated masterpiece of fresh seabass marinated in citus juice, tossed and chopped with Aji Rocoto sauce, red onion, grilled corn and served with sweet potatoes. If you noticed, the three marinades for the Tiger's Milk Trio would make special appearances in various dishes served by the restaurant. I'd say, it was so brilliant for the Chef to maximize on his sauces and ingredients. I just hope he'd go easy with the chopped onions as I had to slowly pluck them out off my plate. However, my heart belongs to the Salmon Nikkei. I'm really a big salmon fan so I fully enjoyed the thinly-sliced Salmon with Yuzu, Ginger Dressing and Wasabi Tobiko. It tastes like salmon sashimi and I love how fresh the fish slices were. 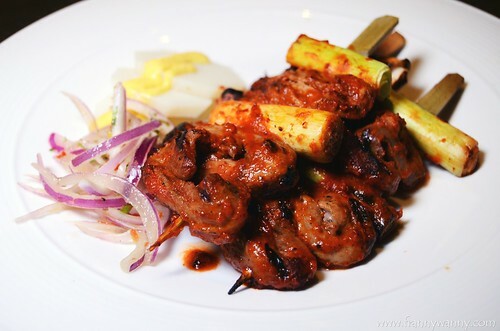 Surprisingly, it made use of the same spicy marinade found in the Tiger's Milk Trio but the flavour here was more toned down. It's no secret how much I love seafood. However, there are times when I miss eating meat. We had the Pork Neck & Shishito (S$16) which was definitely the highlight of our meal. 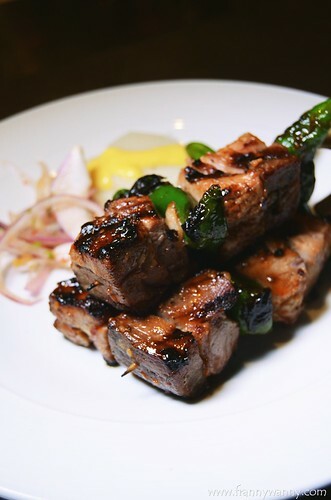 We went crazy over the tender, melt-in-your-mouth pork neck which was marinated and grilled with Shishito peppers and glazed with sweet Yakiniku sauce. This was the BOMB! It was a good thing I was satisfied with the Pork Neck as I wasn't quite impressed with the Lamb Heart (S$16). The texture was very unique and the meat was quite tough and powdery. Not really into lamb part's except for it's leg or meat. 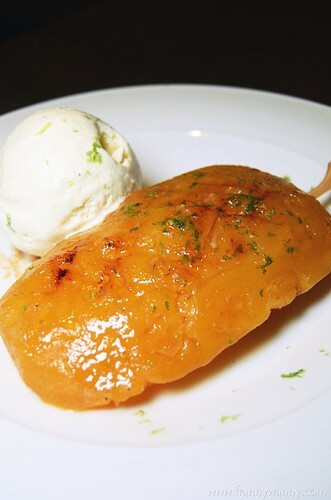 For dessert, we loved the Pineapple Wedge (S$14), sweet pineapple slice with a scoop of ice cream. I love how the pineapple stayed sweet with a hint of robust smokiness. It's perfect for those who loves to eat a mix of savory and sweet. I'm so happy to have my first taste of Peruvian cuisine and I'd say that this is something that I'd love to have again. Check out Tiger's Milk for a nice after-work meal or to catch up with your friends while enjoying the lovely view of Singapore's central business district. 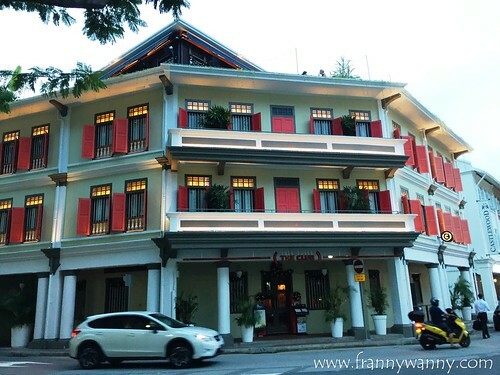 Tiger's Milk is located at The Club, 28 Ann Siang Road, Singapore 069708. Call them at 6808-2188.